The official Twitter and YouTube accounts for the US military's Central Command (CENTCOM) that oversees operations in Central Asia and the Middle East were hacked on Monday by a hacker group claiming association with Islamic State militant group, also known as ISIS. The hacker group, appears to call itself "CyberCaliphate", managed to gain access to the CENTCOM social accounts, and posted some screenshots of documents, allegedly internal CENTCOM documents, with links to what they described as leaked military files. Meanwhile, YouTube page related to the US military’s Central Command was set to display propaganda videos in support of the terrorist group ISIS. "US and its satellites kill our brothers in Syria, Iraq and Afghanistan we broke into your networks and personal devices and know everything about you. You'll see no mercy infidels. ISIS is already here, we are in your PCs, in each military base. With Allah's permission we are in CENTCOM now. We won't stop! We know everything about you, your wives and children. US soldiers! We're watching you!" The post also includes link to a .zip file labeled ‘US Army Files’ and images depicting what appears to be lists of names, addresses and contact information of the US Army members, as well as budget documents from last year. 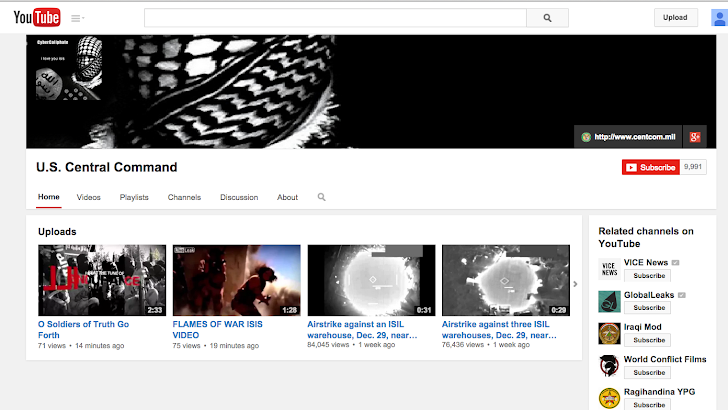 Two videos were uploaded to the Centcom YouTube account supporting ISIS, a Sunni Muslim terrorist group that operates in the same geographic regions as Centcom. The first message posted to the Twitter account was around 9:30 a.m. PST, while the first YouTube videos showed up around an hour later. Following the hack, both the Centcom’s Twitter and YouTube accounts was suspended. "We can confirm that the Centcom Twitter and YouTube accounts were compromised earlier today," a Central Command spokesperson said. "We are taking appropriate measures to address the matter. We have no further information to provide at this time." Centcom later called the hack "cybervandalism," saying no classified information was released and none of its internal computer servers was breached. None of the released information was terribly sensitive and there was "no operational impact" on military networks from a hacking incident carried out by people claiming to be working on behalf of of the Islamic State of Iraq and the Levant (ISIL). Some of it is readily available on public websites. The hack came just moments after President Barack Obama concluded an address at the Federal Trade Commission headquarters in Washington, DC, where he announced new proposals aimed at bolstering American cybersecurity after high-profile hacking incidents including one against Sony Pictures Entertainment that U.S. officials blamed on North Korea.